In the summer of 2016 I was given a package of Mahler DVDs produced and directed by Jason Starr, a prolific maker of dozens of video and films, from classical music and modern dance performances to documentary profiles of artists and cultural issues. He began his Mahler odyssey in 2003 with a splendid deconstruction of what Mahler himself called “a musical poem that travels through all the stages of evolution.” I wrote about What the Universe Tells Me: Unravelling the Mysteries of Mahler’s Third Symphony – Starr’s impressive 60-minute film – in the September 2016 issue of WholeNote in conjunction with the TSO’s performance of the symphony then. Having noticed the TSO’s upcoming performance of Mahler’s Symphony No.2 “Resurrection” on April 17, 18 and 20, I decided to take another look at Of Love, Death and Beyond, Starr’s 2011 exploration of that monumental work. The combination of an all-star orchestra and chorus conducted by Neeme Järvi, with narration by Thomas Hampson and talking Mahlerian heads led by Henry-Louis de La Grange, produced a rich tapestry of insight and background, some of which I thought I would share to illuminate what has become a cornerstone of the symphonic repertoire. When Mahler began working on his second symphony in 1888, he was “a 27-year-old itinerant conductor and virtually unknown as a composer.” By the time of its premiere in December 1895, Mahler’s conducting star was burning brightly, although the negative reception of his first symphony still lingered. The Andante Moderato second movement is mysterious and threatening in tone, but not without considerable charm, as happiness alternates with melancholy memory. The spooky and sardonic third movement is a parody of the Biblical fish sermon with a mocking tone that leads into music riven by despair. The basis of the fourth movement (Primal Light) is a child-like woman’s voice (sung by a mezzo-soprano) with text from one of Mahler’s favourite literary sources, the poems of Des Knaben Wunderhorn. There is compassion and simplicity in the voice of the child who is driven by a desire to enter heaven and be reborn into eternal blessed life. The fifth and final movement opens with a reference to the third movement before we are treated to a series of tableaux that expand the bounds of the concert hall with two off-stage bands and otherworldly horns. The notes of the Dies Irae musical reference of the first movement is reversed, a sign that personal rebirth is on its way. A visceral percussion build followed by a march made up of popular music announces the struggle between the Dies Irae and resurrection motifs which morph into an apocalyptic tension. Then, after barely audible offstage brass, mass hysteria leads into celestial calm and an omnipotent feeling of love takes over. The chorus enters (everyone partakes of the resurrection) in one of the most sublime moments in all of music. Mahler’s own text leaves out much of the original religious content, replacing it with spirituality. Ultimately, a new life is unleashed. There had never been a symphonic movement of such scope and dramatic impact. It still generates a genuinely palpable feel-good climax. To illustrate the instrumental scope in personnel alone, this is what Mahler called for: four flutes (all doubling piccolo), four oboes (two doubling English horn), four clarinets (one doubling bass clarinet and another doubling E-flat clarinet) plus E-flat clarinet, four bassoons (two doubling contrabassoon), ten horns, ten trumpets, four trombones, tuba, timpani (two players), cymbals, triangle, military drum, orchestra bells, chimes, bass drums, tam-tams, two harps, organ and strings, plus soprano and mezzo-soprano soloists and a mixed chorus; an offstage band comprising four trumpets, bass drum with cymbals attached and additional triangle; another off-stage band consisting of four horns and additional timpani. The TSO presents Mahler’s Symphony No.2 “Resurrection” on April 17, 18 and 20 at 8pm in Roy Thomson Hall. With Joëlle Harvey, soprano; Marie-Nicole Lemieux, contralto; Amadeus Choir; Elmer Iseler Singers; renowned Spanish conductor Juanjo Mena takes the baton. Louis Langrée has been music director of the Mostly Mozart Festival at Lincoln Center in New York since 2002 and of the Cincinnati Symphony Orchestra since 2013. On April 10, 12 and 13, he will lead the TSO in another pillar of the classical music canon, Beethoven’s Symphony No.3 “Eroica.” Originally dedicated to Napoleon Bonaparte (the composer later defaced his original dedication to the French emperor, calling him a tyrant), the Eroica marked the beginning of Beethoven’s Middle Period and was a major musical step forward in his symphonic writing. The first movement’s grandeur is followed by the unnerving, influential funeral march and the uncanny scherzo which set the stage for the finale’s theme and variations that pushed the expressive envelope of 1803. Uncompromising and challenging to this day, the Eroica marked a bold step into the 19th century for a work that has never lost its power to connect emotionally. Opening the program is another keystone of the repertoire, Debussy’s hugely popular Prélude à l’après-midi d’un faune (1894) that stretched the traditional system of keys and tonalities to their late 19th-century limits. Rounding out the evening’s first half is Szymanowski’s Violin Concerto No.1 (1916), considered one of the first modern violin concertos and a musical heir to Debussy’s work. Christian Tetzlaff, whose consummate musicianship and versatility have long been a source of great pleasure, is the violin soloist. As spring blossoms fill our senses, it’s time to partake in the fruits of another year’s worth of musical training. Nine Sparrows Arts Foundation presents “Rising Stars” of the U of T Faculty of Music on April 2 and of the Glenn Gould School on April 30 and May 7. Admission is free for these 12:10pm recitals at Yorkminster Park Baptist Church in midtown Toronto. The Royal Conservatory presents the Glenn Gould School Chamber Music Competition Finals in Koerner Hall at 7pm on April 3. Tickets are required (but free) and can be reserved a week in advance. At noon on April 9, the COC presents “Rachmaninoff-Go-Round,” a free concert featuring GGS piano students playing selections from Six Moments musicaux, Op.16 in the Richard Bradshaw Amphitheatre of the Four Seasons Centre. In the same location, on April 10 at noon, the COC presents a free concert featuring the winner of the GGS Chamber Music Competition. On the same day at 7:30pm in Mazzoleni Hall, RCM presents the final Rebanks Family Fellowship concert of the season (free; ticket required). The future is ours to see. APR 7, 2PM: The Gallery Players of Niagara present the Gryphon Trio at 25 years young! Fresh from winning their latest JUNO, the venerable trio’s program includes works by Haydn, Brahms and Wijeratne. FirstOntario Performing Arts Centre, St. Catharines. APR 7, 3PM: RCM presents the justly celebrated American pianist Richard Goode in an all-Beethoven recital topped off by the master’s final sonata, the celestial Op.111. Goode will also give two masterclasses in Mazzoleni Hall, to which the public is welcome, on April 5 at 2pm and April 6 at 2:30pm. APR 7, 7:30PM: Gallery 345 presents pianist/scholar/writer Jarred Dunn in a recital comprised of a selection of Chopin pieces along with Beethoven’s penultimate sonata, Op.110. Featured on the 2018 CBC Top 30 Under 30 list, Dunn has been highly praised by piano stalwarts Seymour Bernstein and David Dubal. APR 14, 2PM: Chamber Music Hamilton presents the luminous Calidore String Quartet in a superbly constructed program of Haydn’s String Quartet in F Major Op.77, No.2, Beethoven’s String Quartet Op.131 and two pieces by Pulitzer Prize-winner Caroline Shaw (whose Taxidermy was one of the revelations of the recent 21C Music Festival performance by Sõ Percussion). APR 14, 3:15PM: Mooredale Concerts presents the New Orford String Quartet whose impeccable musicianship will be on display in an all-Beethoven program featuring a quartet from each of the composer’s early (Op.18, No.4), middle (Op.74) and late (Op.131) periods. APR 18, 8PM: Music Toronto presents the Ariel Quartet (winner of the prestigious Cleveland Quartet Award in 2014) in a program they call “Neue Bahnen (New Paths).” The title comes from Schumann’s famous article from 1853 heralding a new era with the arrival of the then-unknown Brahms. The program highlights the special relationship Schumann and Brahms shared, and looks back to Beethoven and forward to Webern. APR 27, 7:30PM AND APR 28, 2:30PM: Elsewhere in these pages David Jaeger writes extensively about Marjan Mozetich, whose Postcards from the Sky is part of this concert by the Niagara Symphony Orchestra. Another reason to attend is to catch up with one-time prodigy, pianist Anastasia Rizikov, featured in Shostakovich’s Concerto in C Minor for Piano and Trumpet and String Orchestra. Arvo Pärt’s Cantus in Memoriam Benjamin Britten and Tchaikovsky’s Serenade for Strings complete the surefire program. Bradley Thachuk conducts. APR 28, 3PM: Jeffery Concerts presents the five-time Grammy Award winner, MacArthur Foundation Fellow, Dawn Upshaw, singing Respighi’s haunting Il Tramonto and Schoenberg’s visionary String Quartet No.2 with the esteemed Brentano String Quartet (who also perform Haydn’s Op.20, No.2 and Bartók’s String Quartet No.2). Wolf Performance Hall, London. MAY 1, 8PM: Pianist Peter Serkin, heir to the Busch-Serkin musical family, makes his Koerner Hall debut performing Mozart's Adagio K540 and Piano Sonata K570 as well as Bach's Goldberg Variations. Serkin replaces the originally scheduled Murray Perahia, who is unable to appear due to a sudden medical setback. MAY 2, 12PM: Spring may be in the air, but summer’s not too far from violinist Jonathan Crow’s mind as he previews the 2019 Toronto Summer Music Festival – Crow is its artistic director – in this COC free concert at the Richard Bradshaw Amphitheatre in the Four Seasons Centre. MAY 2, 1:30PM: The Women’s Musical Club of Toronto closes out their season in Walter Hall with a strong program – Mozart, Schafer and Beethoven – by the acclaimed Rolston String Quartet, who have been on an extensive tour since winning the 12th Banff International String Quartet Competition in 2016. Named one of CBC’s 30 Hot Canadian Classical Musicians Under 30 and recent winner of the prestigious Cleveland Quartet Award, the Rolstons – who take their name from Canadian violinist Thomas Rolston, longtime director of the Music and Sound Programs at the Banff Centre -- are currently fellowship quartet-in-residence at the Yale School of Music. On March 17, Christian Blackshaw, now 70, brings a selection of works from his acclaimed Complete Mozart Sonata Series, performed and recorded at London’s Wigmore Hall, to Walter Hall. Hailed as “magical,” “captivating,” and “masterful,” the fourth volume of the series was named as one of the Best Classical Recordings of 2015 by The New York Times. Blackshaw’s all-Mozart program for Mooredale Concerts will include Sonata No.11 in A Major, K331 and Sonata No.14 in C Minor, K457. A multi-talented artist who speaks five languages, Melik produced and directed a documentary last year about Armenian composer Arno Babadjanian. She has published books of poetry in Russian, which were translated into Armenian by the Writer’s Union of Armenia in 2016. Together with her CD, a book of French and English poetry was simultaneously released in October 2017. COC presents Nuné Melik’s “Hidden Treasures – Armenian music unearthed” on March 12, with collaborative pianist Michel-Alexandre Broekaert, a free concert in the Richard Bradshaw Amphitheatre of the Four Seasons Centre. The Castalian String Quartet, founded in 2011 and based in London, England, was a finalist in the 2016 Banff Competition won by the Rolston String Quartet. Last year they were named the winner of the first Merito String Quartet Award/Valentin Erben Prize which includes €20,000 for professional development, along with a further €25,000 towards sound recordings and a commission. The award came as a complete surprise to the quartet since there was no application process or competition for it; instead a secret jury assembled a shortlist of five quartets which were then observed in at least two concerts during the course of a year, always without the musicians’ knowledge. The Castalian String Quartet performs in the Richard Bradshaw Amphitheatre of the Four Seasons Centre in a COC free noon-hour concert on April 4. The program includes Haydn’s String Quartet Op.76, No.2 “Fifths” (a reflection of the Castalians’ passion for the inventor of the string quartet), and Britten’s String Quartet No.2, written just after WWII to mark the 250th anniversary of Henry Purcell’s death. Now in her mid-20s, Georgian pianist Mariam Batsashvili is another promising young artist. She began studying the piano at four; by seven, “completely in love with the instrument,” she knew she wanted to be a pianist for the rest of her life. She gained international recognition at the tenth Franz Liszt Piano Competition in Utrecht in 2014, where she won First Prize as well as the Junior Jury Award and the Press Prize. This success led to performances with leading symphony orchestras, and to an extensive program of recitals in more than 30 countries. She was nominated by the European Concert Hall Organisation (ECHO) as Rising Star for the 2016/17 season. A BBC Radio 3 New Generation Artist, she is performing at major festivals and concert venues across the UK as part of that award. Her comprehensive April 4 recital in the Music in the Afternoon series of the Women’s Musical Club of Toronto begins with Busoni’s soaring arrangement of Bach’s iconic Chaconne from Partita No. 2 for violin, BWV 1004, taps into Schubert’s fountain of lyricism, the Impromptu Op.142, No.1 D935, moves on to Mozart’s haunting Rondo in A Minor, K511 and Liszt’s virtuosic Hungarian Rhapsody No.12; then concludes with Beethoven’s notoriously difficult Sonata No.29 in B-flat Major, Op.106 “Hammerklavier.” In Walter Hall; just a few weeks after a performance in London’s Wigmore Hall. Janina Fialkowska’s March 11 recital for the Kitchener-Waterloo Chamber Music Society, marking her 37th year of performing for KWCMS, features an ambitious, well-packed program that begins with Mozart’s beloved Sonata in A Major, K310. An impromptu by Germaine Tailleferre; a nocturne by Fauré; an intermezzo by Poulenc; two pieces by Debussy; and Ravel’s Sonatine – a selection of music by French composers, reminiscent of a French program by Fialkowska’s teacher, Arthur Rubinstein – lead into three mazurkas, a nocturne (Op.55, No.2), scherzo (No.3) and ballade (No.4) by Chopin (the composer with whom she is most identified) performed in Fialkowska’s inimitable style. Later in the month, clarinetist James Campbell joins the Penderecki String Quartet for Brahms’ splendid Clarinet Quintet. Dvořák’s Quartet No.10 in E-flat Major, Op.51, “Slavonic” is the other major work on the March 20 program. Timothy Steeves steps away from his usual role as pianist with Duo Concertante for a recital of four adventurous Haydn sonatas on April 1, his second all-Haydn recital for the KWCMS. The following week on March 14, the Lafayette String Quartet – artists-in-residence at the University of Victoria since 1991 – who have spent more than 30 years together with no changes in personnel – partners with the Saguenay (formed in 1989 as the Alcan) String Quartet to perform three string octets. Join them in this rare opportunity to hear Niels Gade’s String Octet in F Major, Op.17, Russian-Canadian Airat Ichmouratov’s String Octet in G Minor, Op.56, “The Letter” and Mendelssohn’s deservedly famous Octet in E-flat Major, Op.20. The Saguenay String Quartet) and the Lafayette have played together many times, a reflection of their special musical bond and creative friendship. MAR 9, 7:30 AND 10, 3PM: Gemma New leads the Toronto Symphony Orchestra in Shostakovich’s kinetic Symphony No.5; Kelly Zimba, flute, and Heidi Van Hoesen Gorton, harp, take charge of Mozart’s Concerto for Flute and Harp K299/297c, the first work Mozart ever wrote for that combination of soloists. MAR 10, 2:30PM: Bradley Thachuk leads the Niagara Symphony Orchestra and TSO concertmaster Jonathan Crow in Sibelius’ richly Romantic Violin Concerto Op.47. Sibelius’ satisfying Symphony No.3 completes the nod to the great Finnish composer. MAR 16, 7:30PM: Gemma New conducts the Hamilton Philharmonic Orchestra in a heavenly program featuring Debussy’s hypnotic Prelude to the Afternoon of a Faun and his impressionistic Nocturnes. Holst’s riveting The Planets completes the exciting evening. MAR 20, 2:30PM: Georgian Music brings the Lafayette and Saguenay String Quartets to Barrie for a repeat of their Music Toronto program of March 14 headed by Mendelssohn’s youthful masterwork, his Octet in E-flat Major, Op.20. MAR 23, 7:30PM: Barrie Concerts presents the Penderecki String Quartet in an evening of Dvořák’s chamber music. Included are the composer’s String Quartet No.10 “Slavonic” and, aided by pianist Benjamin Smith, both of his piano quintets, the second of which (Op.81) is one of the masterpieces of the form. MAR 23, 7:30PM: The Oakville Chamber Orchestra celebrates their 35th anniversary with a performance of Bach’s Six Brandenburg Concertos, an invigorating choice of music for such an auspicious occasion. MAR 27 AND 28, 8PM: Gunther Herbig, TSO music director from 1989 to 1994, conducts two pillars of the 19th-century repertoire: Schubert’s moving Symphony No. 8 “Unfinished” and Bruckner’s Symphony No.9, the fourth movement of which the composer left unfinished on the day he died, leaving only the first three movements complete. MAR 30, 7PM: Mandle Cheung continues to realize his conducting dream, leading his orchestra in Tchaikovsky’s Piano Concerto No.1 (Kevin Ahfat is the soloist) and Mahler’s titanic Symphony No.1. MAR 30, 8PM: The Canadian Sinfonietta, with guest violist Rivka Golani, mark the onset of spring with the world premiere of David Jaeger’s Raven Concerto for viola and chamber orchestra, Copland’s lovely Appalachian Spring, Britten’s Lachrymae Op.48a for viola and strings and Elgar’s Serenade for Strings. Tak Ng Lai conducts. MAR 30, 8PM AND 31, 2PM: The Oakville Symphony celebrates the musical friendship between Brahms (Symphony No.2) and Dvořák (Violin Concerto). Leslie Ashworth is the violin soloist; Robert De Clara, music director since 1997, conducts. APR 7, 1PM: Gramophone magazine called American-born Marina Piccinini “the Heifetz of the flute.” Find out why at the RCM free (ticket required) concert at Mazzoleni Hall; with Benjamin Smith, piano. APR 7, 3PM: RCM presents the justly celebrated American pianist Richard Goode in an all-Beethoven recital that includes the “Pastoral,” “Moonlight” and “Les adieux” sonatas, and selections from the Op.119 Bagatelles, all topped off by the master’s final sonata, the celestial Op.111. Escape the February doldrums and get a taste of spring! The National Arts Centre Orchestra is planting musical seeds with its February 23 concert at Roy Thomson Hall by making Schumann’s Symphony No.1 “Spring” the program’s centrepiece. Two years after he composed it, Schumann sent a letter to the conductor Wilhelm Taubert, in Berlin: “If only you could breathe into your orchestra, when it plays, that longing for spring! It was my main source of inspiration when I wrote the work in February 1841. I should like the very first trumpet call to sound as though proceeding from on high and like a summons to awaken. In the following section of the introduction, let me say, it might be possible to feel the world turning green; perhaps . . . a butterfly fluttering; and in the Allegro the gradual assemblage of everything that belongs to spring. However, it was only after I had completed the composition that these ideas came to my mind.” Before intermission, Jocelyn Morlock’s Cobalt, a concerto for two violins and orchestra, sets the table for French pianist David Fray who joins conductor Alexander Shelley and the NACO for Chopin’s Piano Concerto No.2 with its lyrical Larghetto. Chopin was 19 when he wrote this elegant work. February is a busy month for the TSO. Brahms’ final work for orchestra (1887), his Double Concerto for Violin and Cello showcases the considerable talents of concertmaster Jonathan Crow and principal cellist Joseph Johnson on February 6, 7 and 9. Conductor Sir Andrew Davis has recorded all nine of Dvořák’s symphonies so we can look forward to an insightful performance of the Czech master’s Sixth Symphony (1880). It may not have the cachet of the Eighth or Ninth, but Dvořák’s inimitable tunefulness is delightful in its own right. And its Brahmsian nature makes a good pairing with the concerto. The force of nature that is Barbara Hannigan brings her immersive soprano voice and burgeoning conducting chops to a program that places Haydn’s Symphony No.86 squarely in the middle of a 20th-century mindset (Debussy’s sinewy Syrinx for solo flute and Sibelius’ ominous and icy tone poem for soprano and orchestra, Luonnotar, open the program). From Haydn to Berg brings Hannigan into her comfort zone with the Suite from Lulu. Bill Elliot and Hannigan’s arrangement of Gershwin tunes, Suite from Girl Crazy, brings the February 13 and 14 evening’s entertainment to a rousing finish. The orchestra even joins in to sing the chorus of Embraceable You. When Casablanca was released in 1942 it marked the beginning a beautiful friendship between moviegoers and this Hollywood classic. Currently No.2 on the American Film Institute’s Greatest Films List, this romantic tale of a cynical American expat/nightclub owner whose idealism triumphs over his broken heart has never lost its lustre – Humphrey Bogart and Ingrid Bergman head the indelible cast. Max Steiner’s score subtly supports the movie’s mood without intruding on the action or the dialogue; but when called upon, as in the Paris flashback, its lush nostalgia rises to the occasion. The Austrian-born composer (his godfather was Richard Strauss) scored more than 300 films, from King Kong and Gone with the Wind to The Treasure of the Sierra Madre. Strategically programmed post-Valentine’s Day on February 15 and 16, the TSO’s live accompaniment to the film will make for a memorable cinematic experience. February 20 and 21, Seattle Symphony principal guest conductor and music director-designate, Thomas Dausgaard, leads the TSO in Bartók’s Concerto for Orchestra, one of the touchstones of the 20th century. Before intermission, American cellist Alisa Weilerstein brings her intensity and sensitivity to Shostakovich’s profound Cello Concerto No.2. Now to several February concerts that I wrote about more extensively in our December/January issue. The renowned klezmer violinist/vocalist/composer, Alicia Svigals, performs her original score to the 1918 silent film, The Yellow Ticket, along with virtuoso pianist Marilyn Lerner, at FirstOntario Performing Arts Centre in St. Catharines on February 7, the Burlington Centre for the Performing Arts on February 8 and the Oakville Centre for the Arts on February 16. Celebrated Finnish pianist, 37-year-old Juho Pohjonen – praised by The New York Times for “his effortless brilliance” – appears on the Jane Mallett stage February 5 playing Rameau, Mozart and Beethoven. Even more celebrated are the musicians in Music Toronto’s February 14 recital. After an early Beethoven quartet and a newly commissioned work by Lembit Beecher, the latest incarnation of the legendary Juilliard String Quartet is joined by the illustrious pianist, Marc-André Hamelin, for a performance of Dvořák’s sublime Piano Quintet in A Major, Op.81, one of the greatest piano quintets ever written. Don’t miss this rare opportunity to hear Hamelin play chamber music! The Royal Conservatory presents rising star, violinist Blake Pouliot, in a free (ticket required) concert in Mazzoleni Hall, February 3. The appealing program includes music by Mozart, Janáček, Kreisler and Saraste. Later in the afternoon of February 3, but in Koerner Hall, RCM presents Charles Richard-Hamelin in a recital of Schumann and Chopin (all four of the sumptuous Ballades). Jan Lisiecki, now almost 24, continues nurturing his international career. His March 3 Koerner Hall concert is sold out but a few rush seats will become available on the day of the performance. Works by Chopin, Schumann, Ravel and Rachmaninoff comprise the challenging program. FEB 3, 2PM: Chamber Music Hamilton presents the Grammy Award-winning Parker Quartet playing Shostakovich’s Two Pieces for String Quartet and Janáček’s “Kreutzer Sonata” Quartet before being joined by Chamber Music Hamilton’s co-artistic director, violinist Michael Schulte and veteran cellist David Hetherington for Brahms’ beloved String Sextet No.2. FEB 9, 8PM: Kristian Alexander conducts the Kindred Spirits Orchestra in a rousing program of Respighi’s crowd-pleasing Fountains of Rome, Prokofiev’s virtuosic Sinfonia Concertante Op.125 (with cello soloist Andrew Ascenzo) and Rachmaninoff’s Symphonic Dances Op.45. FEB 10, 3PM: Amici chamber ensemble, augmented by TSO winds and Glenn Gould School students, presents Mozart’s marvellous Serenade No.10 in B-flat Major K361/370a “Gran Partita” and Mozart’s Piano Trio in C Major K548; in Mazzoleni Hall. FEB 12, 8PM: Roy Thomson Hall presents acclaimed violinist (and music director of the renowned Academy of St Martin in the Fields) Joshua Bell in recital with pianist Sam Haywood. The program includes sonatas by Beethoven (No.4), Prokofiev (No.2) and Grieg (No.2). The rest of the program (à la Itzhak Perlman) will be announced from the stage. FEB 17, 2PM: The always entertaining Eybler Quartet presents the aptly named “Esterházy to Vienna, A Road Well Travelled,” comprising string quartets by Asplmayr (Op.2), Haydn (Op.54, No.2) and Beethoven (the resplendent Op.59, No.2 “Razumovsky”). FEB 22, 7:30PM: Since its formation in 2010 by four graduate students at U of T, the Ton Beau String Quartet “aims to highlight voices of young composers, particularly women composers and composers from under-represented communities.” Their upcoming recital, presented by 3 in the 6ix, features Joaquín Turina’s La Oracion del Torero, Toronto-based Laura Sgroi’s String Quartet No.1 and Debussy’s brilliant String Quartet in G.
FEB 27, 7:30PM: Getting to know Toronto even more since their Mooredale Concerts recital last September, the Calidore String Quartet, currently in residence at U of T’s Faculty of Music, performs Haydn’s String Quartet in F major, Op.77, No.2; Caroline Shaw’s new commission, Entr’acte and First Essay: Nimrod; and Beethoven’s monumental String Quartet in C-sharp Minor, Op.131. Anyone who heard Shaw’s delightful “ballad” Taxidermy, one of several highlights of Sõ Percussion’s 21C Music Festival concert on January 19, needs no urging to hear her piece for string quartet. FEB 28, 1:30PM: The Women’s Musical Club of Toronto presents “Bass Masters through the Ages” with double bass virtuoso Joel Quarrington and friends Yehonatan Berick and Blythe Allers, violins; David Jalbert, piano; Alisa Klebanov, viola; Carole Sirois, cello; and Gabriel Sakamoto, double bass. Music by Schumann, Korngold, Schubert and Tovey. MAR 3, 8PM: Gallery 345 presents “Music from Marlboro”: Haydn’s Piano Trio in C; Kodály’s Serenade Op.12; K. Ueno’s Duo (Marlboro commission/premiere); and Ravel’s Piano Trio in A Minor. With Robin Scott and Tessa Lark, violins; the inspirational Kim Kashkashian, viola; Christoph Richter, cello; and Zoltán Fejérvári, piano. Justyna Gabzdyl: After graduating from the Fryderyk Chopin Academy (now University) of Music in Warsaw in 2005, Polish-born pianist, Justyna Gabzdyl, continued her studies at the École Normale de Musique Alfred Cortot in Paris before earning a doctorate at Université de Montréal in 2012. Now 36 and based in Canada, Gabzdyl will be performing in Walter Hall in a U of T Faculty of Music recital on January 24; works by Syzmanowski and Gershwin will be featured. She spoke to La Scena Musicale for their February/March 2018 issue and detailed her fondness for Syzmanowski. Szymanowski often travelled to Italy, Sicily, North Africa and France – destinations with which Gabzdyl is familiar, having lived in France, and visited the Maghreb numerous times. Hugo Kitano, 22, is a double major at Stanford (music and computer science) and an international prizewinner. His COC free noon-hour recital January 31 is comprised of Beethoven’s penultimate piano Sonata No.30, Op.110 and Chopin’s resplendent Polonaise-Fantaisie Op.61. Kitano has worked extensively with John Perry who also finds time to visit the Glenn Gould School on a regular basis as a faculty member. Charles Richard-Hamelin’s star is still rising; the honeymoon from his Warsaw Chopin Competition honours in 2015 has evolved into a major concert schedule that brings him to Koerner Hall on February 3. Two C-Major works by Schumann, the Arabesque Op.17 and the Fantasy Op.16 precede a performance of Chopin’s Four Ballades. The 29-year-old pianist gave an insightful interview to Bachtrack on September 30, 2016 that showed the same maturity beyond his years that his piano playing already reflected. Juho Pohjonen: The celebrated Finnish pianist, 37-year-old Juho Pohjonen, is another “fast-rising star” (The Guardian). His impressive NYC recital debut in 2004, while he was still a student at the Sibelius Academy, was praised by The New York Times as “formidable” and “breathtaking.” Lately his association with the Chamber Music Society of Lincoln Center has brought him more attention for “his effortless brilliance.” All of which only adds to my anticipation for his Music Toronto recital on February 5. His program pairs two suites by Rameau from his Nouvelles suites de pièces de clavecin with late works by Mozart (Rondo in A Minor K511) and Beethoven (Sonata No.28 in A Major, Op.101). Younggun Kim: Fifth in this handful of talented young pianists, South Korean-born, Toronto-based, U of T Faculty member Younggun Kim will show off his dazzling technical prowess in a recital in Walter Hall on February 7. The demanding program moves from the Bach-Busoni Chaconne to Godowsky’s fiendishly difficult Studies on Chopin’s Etudes and Ravel’s jaw-dropping La Valse. Heath: When the Heath Quartet made their memorable Toronto debut in January 2017, their second violinist had just left the ensemble to spend more time with her family. Nonetheless, their dynamism and exuberance were evident even with a last-minute replacement. Now, with a new violinist in place, they make a welcome return to Walter Hall early next February. Sure enough, the paradigm still stands. For their Mooredale Concerts recital on February 3, they begin with Mozart’s Quartet K465 “Dissonance,” its nickname owing to the harmonic boldness of the slow introduction to its first movement. The most famous and last of the six quartets Mozart dedicated to “my dear friend Haydn,” will undoubtedly introduce the possibilities of what a string quartet can do. The quartet is devoting this concert season to all three of Benjamin Britten’s quartets. We get to hear his first, commissioned in 1941 by the famous American patroness, Elizabeth Sprague Coolidge, who had previously commissioned Bartók’s Fifth Quartet (1934) and Schoenberg’s Fourth (1936). The emotional centre of the work, the long Andante Calmo third movement, is filled with melancholy beauty. The afternoon concert concludes with Beethoven’s iconic String Quartet No.9, Op.59 No.3, one of the biggest of Beethoven’s quartets. Benedetti: The enthralling Scottish violinist, Nicola Benedetti, makes her second visit to Toronto this season with her Koerner Hall recital on January 25. Her TSO engagement last September, playing Prokofiev’s Violin Concerto No.2, broadened into a visit to Sistema Toronto that was chronicled by David Perlman on thewholenote.com in October. In Koerner Hall, she’ll be performing with Kiev-born pianist Alexei Grynyuk, a regular chamber music partner with Benedetti in the Benedetti, Elschenbroich, Grynyuk Trio. In 1942, Prokofiev found himself in far-off Central Asia working on the score for Eisenstein’s classic film Ivan the Terrible. For a change of pace he began to compose a sonata for flute and piano which was premiered in Moscow the following year to a lukewarm response. David Oistrakh suggested that Prokofiev turn it into a violin sonata, which he did, saying that he wanted to write it in a “gentle, flowing classical style.” That Violin Sonata No.2, with all its wit, lyricism, expressiveness and mood changes, is a centrepiece of a recital that begins with Bach’s unalloyed solo masterwork, the Chaconne from Partita No.2, and includes a Wynton Marsalis premiere and Richard Strauss’ surprisingly seductive Violin Sonata Op.18. Pouliot: Twentysomething Canadian violinist Blake Pouliot won the 2018 Women’s Musical Club of Toronto Career Development Award, an honour that followed his Grand Prize win at the 2016 Orchestre Symphonique de Montréal (OSM) Manulife Competition. His recent Debussy-Ravel Analekta CD was praised by WholeNote Strings Attached columnist Terry Robbins as “an outstanding recording debut.” Robbins noted that “Pouliot plays with strength, clarity, warmth, faultless intonation and a fine sense of phrase… [drawing] a gorgeous tone from the 1729 Guarneri del Gesù violin on loan from the Canada Council for the Arts.” With Hsin-I Huang at the piano, Pouliot gives a free (ticket required) concert in RCM’s Mazzoleni Hall Sunday afternoon, February 3. Don’t miss the opportunity to experience this star on the rise in an appealing program of Mozart (K379), Janáček, Sarasate and Chausson (the divine Poème). DEC 8, 8PM: Violinist Alexandre Da Costa, who divides his time between Montreal and Australia, brings his Stradivarius 1701 to the Glenn Gould Studio stage when he joins Nurhan Arman and Sinfonia Toronto in “The Eight Seasons,” featuring Vivaldi’s The Four Seasons and Piazzolla’s The Four Seasons of Buenos Aires. DEC 16, 8PM: The Kitchener-Waterloo Chamber Music Society celebrates Beethoven’s 248th birthday with a compelling program that includes the Kreutzer Sonata, Eyeglass Duo and Archduke Trio. Angela Park, piano, Yehonatan Berick, violin, and Rachel Mercer, cello, make it happen as the AYR Trio. JAN 10 AND 12, 8PM; JAN 13, 3PM: Intrepid Mississauga-born violinist, Leila Josefowicz, joins the TSO for a performance of Stravinsky’s Violin Concerto, the composer’s particular take on the Baroque era. David Robertson, American-born conductor of the Sydney Symphony Orchestra, leads the orchestra in Sibelius’ grandly romantic Symphony No.2 and Kurt Weill’s evergreen Suite from the Threepenny Opera. JAN 13, 3PM: Musical inheritance is the theme of the Windermere String Quartet’s upcoming concert, “Keeping It in the Family.” The period-instrument ensemble’s program opens with a J.S. Bach fugue arranged by W.A. Mozart, followed by a divertimento by Leopold Mozart, Wolfgang’s father. Guest artist, traverso player Alison Melville, is featured in J.S. Bach’s son, Johann Christian’s Quartet No.1 for flute and strings; W.A. Mozart’s final string quartet, the masterful String Quartet No.23 in F Major, K590, concludes the Sunday afternoon recital. JAN 15, 12PM: Osvaldo Golijov’s haunting Dreams and Prayers of Isaac the Blind heads a program of chamber music (that also includes works by Villa-Lobos and Piazzolla) performed by artists of the COC and National Ballet Orchestras, in this free noon-hour concert in the Richard Bradshaw Amphitheatre of the Four Seasons Centre. JAN 27, 3PM: Pittsburgh-based guest violist, David Harding, and talented pianist, Todd Yaniw, join Trio Arkel members, Marie Bérard and Winona Zelenka for “the melodies just surged upon me.” The Trio chose this quote by Dvořák because it directly refers to his Piano Quartet No.2 in E-flat Major Op.87, the centrepiece of their Sunday afternoon concert, which also features music by Schubert and Röntgen. JAN 28, 7:30PM: TSO principal cellist, Joseph Johnson, and chamber musician supreme, Philip Chiu, join forces for a U of T Faculty of Music recital featuring music by Beethoven, Britten and Chopin. JAN 31 AND FEB 2, 8PM: After hors d’oeuvres of Wagner’s The Ride of the Valkyries and Berg’s Three Pieces for Orchestra, Sir Andrew Davis and the TSO settle in for the main course: Act I of Wagner’s Die Walküre, with Lise Davidsen, soprano; Simon O’ Neill, tenor; and Brindley Sherratt, bass. 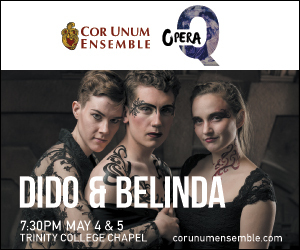 Now in its 13th year and divided into six smaller series – vocal, chamber music, piano virtuoso, jazz, world music and dance – there are very few series in town that cover so many WholeNote areas of interest as the Canadian Opera Company’s remarkable Free Concert Series in the Richard Bradshaw Amphitheatre. This month, for example, in addition to five concerts that jumped out at me, both Lydia Perović in her Art of Song column and Jazz Notes columnist Steve Wallace found noteworthy concerts in their respective beats. It struck me as an opportune moment to ask the series’ program manager Dorian Cox how the curatorial process works. He told me that he programs each series in a slightly different way. The vocal series, for example, “is largely comprised of artists who are already involved with the COC (on the mainstage or part of our Ensemble Studio), whereas the world music and jazz series are largely comprised of artists who have approached me or whom I have sought out.” Overall, about a third of the performances are COC artists, a third are presented in collaboration with other institutions and the last third are independent artists. Cox is always on the lookout for artists who he thinks might want to participate and whom he thinks his audience will appreciate. “It’s a 24/7 job in that way,” he says. “The wheels are always turning and I try to see as many concerts as possible, which can truthfully get a bit overwhelming when I already have 72 that I’m presenting this season.” He feels fortunate to be approached by many performers and connected to others through mutual contacts. And based on what his network is interested in, he finds social media to be a helpful tool. “Remembering Kristallnacht” on November 8 was the first concert that caught my own eye this month. Cox told me that a meeting last January with the German Ambassador to Canada, Sabine Sparwasser (“a huge supporter of the COC”), led directly to it. “She was keen to present a concert and it was her idea to do something that would commemorate the 80th year since Kristallnacht – the wave of violent anti-Jewish pogroms which took place across Germany on November 9 and 10, 1938. Berlin-born pianist Constanze Beckmann (a recent RCM graduate from the studio of John Perry), joins her regular chamber music partner (Glenn Gould School faculty member, Lithuanian-born violinist Atis Bankas), to perform music by Edwin Geist, Joseph Koppel Sandler, Szymon Laks and other persecuted Jewish composers. With the support of the Consulate General of Germany in Toronto, the concert is also part of the Neuberger 2018 Holocaust Education Week. The Golden Violin Competition has been held every year at McGill since 2006. The 2017 winner of its $25,000 prize, Maïthéna Girault, performs on November 21 at noon. Her program had not been finalized by the time our November issue went to press; but programs for each week are posted on the COC website on the Friday before. Clarinetist David Dias da Silva and pianist Olivier Hébert-Bouchard have been touring “Portraits and Fantasias” across Ontario and Quebec with the support of Jeunesses Musicales du Canada (JMC). “JMC is yet another one of our amazing partner organizations,” Cox said. “They help young professional musicians to develop their careers and are experts in coaching the artists to create cohesive and unique programs.” The November 29 concert has yet to be finalized but will include a portion of their touring program: Luigi Bassi’s Fantasia da concerto su motivi del Rigoletto; Debussy’s Première rhapsodie for B-flat clarinet and piano; Schumann’s Fantasiestücke, op.73: I. Zart und mit Ausdruck. The Free Concert Series is justifiably popular. Seating and standing room are limited. Plan on arriving at least 30 minutes in advance. “The very first piece of classical music I heard was Saint-Saëns’ Third Violin Concerto,” Mandle Cheung writes on his website. “I was 13, listening to a pocket-sized radio with earphones. I was born and raised in Hong Kong, and though my family wasn’t particularly musical, from that point, I was hooked on music ever since. “ After he moved to Canada in 1968, he stuck to a sensible major, computer science – but he managed to pick up some music courses along the way, eventually taking up conducting with Arthur Polson and leading the orchestra in Beethoven’s Third Piano Concerto for their graduation concert. Later, he was invited to perform Arthur Benjamin’s Harmonica Concerto with the CBC Winnipeg Orchestra, Eric Wilde conducting. At 70, Mandle Cheung decided to pursue that longtime dream. And with his brand-new orchestra, comprised of almost 70 professional musicians based in the GTA, “All Awakens with Joy.” is finally happening. Mandle Cheung and the Mandle Philharmonic perform Beethoven’s Symphony No. 5 in C Minor, Op.67 and Mahler’s Symphony No.4 in G Major. (Jennifer Taverner is the soprano soloist in the fourth movement of the Mahler.) November 9 at 8pm at the Glenn Gould Studio will see the dream fulfilled, fuelled by passion and hard-won through tireless rehearsal and meticulous study. Admission is by donation. Proceeds will go directly into a career development grant fund – grants will be awarded to promising early career musicians, to aid in professional development. There’s a cornucopia of concertizing at Gallery 345 this month. Here is a sample of the bounty. On November 1, fans of Gregory Millar’s chamber music get an opportunity to hear him as a soloist in the Gallery’s ongoing Art of the Piano series. His recital ranges from CPE Bach to Barbara Pentland, from Beethoven and Chopin to Brahms and Prokofiev. The Mexican-born Alejandro Vela continues the series on November 10 with a program of Gershwin, Granados and Chopin, anchored by Rhapsody in Blue and the Funeral March Sonata. Cellist Noémie Raymond-Friset was recently named one of the 30 hot Canadian musicians under 30 by CBC Music. For her contribution to the Art of the Cello series on November 11, she will perform music by Schumann, Stravinsky, Poulenc and WholeNote contributor David Jaeger (Constable’s Clouds). Peter Klimo is the collaborative pianist. Pianist Jean-Luc Therrien teams up with violinist Jean-Samuel Bez for a program of music by Schubert, Fauré, Lili Boulanger, Enescu and Kreisler on November 22. And TSO assistant principal cello Winona Zelenka continues the Art of the Cello series – with the Gryphon’s Trio’s pianist, Jamie Parker – on December 1, with a fascinating program of Bach, Ligeti, Pärt, Crumb and Bjarnason. The long-running chamber-music series continues its 47th season with three auspicious concerts. On November 15, Ensemble Made in Canada bring their ambitious Mosaïque project to the Jane Mallett stage. This recently commissioned suite of piano quartets by 14 Canadian composers, each inspired by a particular region of Canada, is currently on a nationwide tour of all ten provinces and three territories. After intermission, look for the Ensemble to bring out the subtleties of Schumann’s Piano Quartet in E-flat Major, Op.47. Next, the whole world is the subject of pianist Louise Bessette’s November 27 recital. From John Adams’ China Gates to Percy Grainger’s In Dahomey, Bessette’s musical grand tour consists of 15 diverse selections. Music Toronto stalwarts, the Gryphon Trio, celebrate their 25th anniversary season on December 6, with a variety of works – Mozart, Silvestrov, Pärt and others – before moving into Paul Frehner’s Bytown Waters (commissioned to celebrate the Trio’s milestone), and Brahms’ fully packed Piano Trio in C Major, Op.87. NOV 2 AND 3, 8PM: Pianist Charles-Richard Hamelin (recently named piano mentor at TSM 2019), is the soloist in Brahms’ dramatic Piano Concerto No.1 with the Kitchener-Waterloo Symphony led by Andrei Feher. NOV 4, 6:30PM: Sheila Jaffé, violist in the COC Orchestra, puts on her violinist hat as she joins violinist Jeffrey Dyrda (who recently concluded three seasons as second violin of the Rolston String Quartet), Emmanuelle Beaulieu Bergeron (TSO associate principal cello) and Pocket Concerts co-director, violist Rory McLeod, in Mendelssohn’s String Quartet No.2, Op.13 and Garth Knox’s Satellites, one of the Kronos’ Quartet’s 50 for the Future commissions. NOV 12, 8PM: The Kitchener-Waterloo Chamber Music Society presents two former members of the fondly remembered Cypress String Quartet, Cecily Ward, violin, and Ethan Filner, viola, and Aaron Schwebel (concertmaster of the National Ballet of Canada Orchestra and associate concertmaster of the COC Orchestra), performing works for two violins and viola by Dvořák, Prokofiev, Kodály and more. NOV 15, 7:30PM: York University Faculty of Music presents Duo Forte – Christina Petrowska Quilico and Shoshana Tellner – in a program of danceable four-handed piano repertoire that includes Barber’s Souvenirs, Gershwin’s Cuban Overture, Arthur Benjamin’s Jamaican Rhumba, Kapustin’s jazzy Slow Waltz, Ravel’s brilliant La Valse and Piazzolla’s urgent Libertango. NOV 16, 7:30PM: U of T Faculty of Music presents the New Orford String Quartet and guests performing two cornerstones of the chamber music repertoire: Brahms’ masterful Piano Quintet in F Minor, Op.34 and Mendelssohn’s dazzling Octet Op.20. NOV 21, 8PM; NOV 23, 7:30PM; NOV 24, 8PM: Pianist Kirill Gerstein brings his improvisatory sensibility to Beethoven’s free-flowing Piano Concerto No.4 in G Major, Op.58 while John Storgårds conducts the TSO; the not-to-be-missed program also includes Ravel’s kinetic Boléro. NOV 25, 2:30PM: Violinist Aisslinn Nosky returns to conduct the Niagara Symphony Orchestra in Beethoven’s essential Symphony No.3 “Eroica,” as well as taking the solo part in Haydn’s Violin Concerto in G Major. NOV 30 AND DEC 1, 8PM: Stewart Goodyear, piano, Bénédicte Lauzière, violin, and John Helmers, cello, join conductor David Danzmayr and the Kitchener-Waterloo Symphony in Beethoven’s Triple Concerto in C Major, Op.56, a rare opportunity to hear this underrated work for an unusual combination of soloists. DEC 2, 3:15PM: Mooredale Concerts presents the aptly named Artistic Directors Trio in works by Schumann, Handel and more. Pianist Wonny Song is the artistic and executive director of Orford Music (Quebec) and Mooredale Concerts. Violinist Tien-Hsin Cindy Wu is artistic partner of the Da Camera Society (Los Angeles) and assistant director of the New Asia Chamber Music Society (New York City). Violist Wei-Yang Lin is artistic director of the New Asia Chamber Music Society. Intriguing.